Chromesthesia is a neurological condition and a type of synesthesia in which an individual automatically and involuntarily associates heard sounds with a certain color. All over the world, just about 1% of the people have this condition which is idiosyncratic. The type of color that a particular sound evokes in one person might not be the same as another person. Individuals with this condition spontaneously perceive the synesthetic experience without effort and they accept it as normal everyday experience. One cannot exactly pair the results from one synesthate to another since they vary even with the same tone, sound, pitch or timbre. However, they are consistent at the individual level with every person having a unique colour pairing. There are some hallucinogenic in which under its influence everyone can experiment the music synesthesia whether or not they are synesthetes. For example, it is common that high pitched sounds are matched with brighter or lighter colors while lower pitched sounds are matched with the darker tones. However, synesthetes experience this more regularly, effortlessly and naturally. 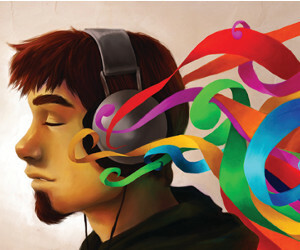 Just like other variations of synesthesia, there are different categories of those who hear in colors. These are the projectors and the associates. The projectors perceive color as occurring in the external space whereas the associates perceive colors in the mind of their eyes. These two terms are however limiting since they do not express the real nature of the experience which the synesthetes say is not totally perceptual. It is reported that people with this condition are more likely to have difficulty with numbers and do confuse their left with their right. The upside of this condition is that it leads to higher creativity and sound memory. Most artists have been diagnosed with this condition. They include hip hop producer Pharrell Williams, author Vladimir Nabokov and musician Billy Joel. To William, the chromethesia is an indispensable gift that has been the secret behind his great music. He says that listening to the music in colors is fundamental to his creative processes. Although it exists in the bidirectional sound-color, color-sound synesthesia, the first is the most common one. Some individuals have this experience with any kind of sound while others experience it with only certain types of sounds such as prosody, voice pitch and accent. The experiences caused by these stimulus can be consistent but not necessarily similar in either direction. Factors such as levels of concentration, sleep habits, fever, fatigue, caffeine, alcohol, emotions or hallucinogens contribute to the sound to color perceptual experiences. Moreover, differences in brain structures are believed to play a significant role. Upon functional magnetic resonance imaging, the part involved in the integration of visual and auditory information which is the left superior temporal sulcus reveals variations from the "normal". Such differences can also be seen in the inferior parietal cortex and the activation of the parietal lobe. Although is known that is transferred from parents to child, chromesthesia can skip a generation.